My bed has -- with varying degrees of success -- kept track of my sleep during the last few months using the Beddit Pro tracker. 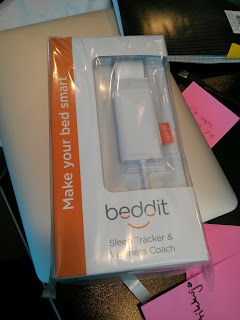 I got to borrow this from a friend who works for Beddit while waiting for the Indiegogo edition Beddit sensor to arrive. Now it has. The beddit sensor technology is pretty fascinating. Basically, the sensor band registers tiny variations in pressure and with a lot of clever signal processing, can deduce my breathing, heartbeat and movements from it. What's really fascinating is that the same sensor technology could be put under a leg of a comfy chair and was able to pick up my heartbeat and breathing through the layers of chair and comf. I was impressed. What's really really fascinating is that in a demo, the sensor could pick up the heartbeat from a driver sitting in a van with the engine on. I haven't seen this demo but it's supposedly there on Youtube. The Beddit Pro is a small embedded computer with one or two "ballistocardic" sensors. You connect one side to your LAN with wired or wireless Ethernet and put the sensors under the sheets of your bed. And then you sleep (or do whatever you do in your bed). I admit that the first night or two, i was very conscious of the sensor but that faded quickly. The results of the Pro are more or less credible. For my wife, they were pretty much off the charts, as she goes into a bit of a coma when reading in bed -- or at least that's what the Beddit thinks. The most confusing bit is that the system reports i got around one hour of deep sleep, and i really have no idea if that's a good thing or a bad one. The results themselves are viewable on Beddit's web site and you can add comments to your sleep diary if you want. The web site is a bit clunky to use, but the new Beddit tracker runs uses your mobile device (phone, tablet, Android or IOS thingy...) as proxy to the Beddit mainframe. As the results will be in an app instead than on a web site, my hopes are that this'll be easier to use. Finally, what i'm really hoping for is proper integration with other trackers out there. My hopes is that i can plug all sorts of biometrics into Human API and spin and mash my data from there. We'll have to see. Tonight i'll connect the new sleep tracker and in a week from now, i should have something new to report. PS: This would have been a typical post to my normal blog, but as it's down (see previous post) you'll see it here. It’s rather tragic that i didn’t even realise that the funding account for my blog ran out and i didn’t even notice. And that the blog fell off the Internet (due to zero funding) and i didn’t even notice. And was deleted, along with all its settings, and i didn’t even notice. On the bright side, i had set up automatic backups that were sent to my mail. And now i have a learning opportunity to see what i should be doing with them. Oh dear oh dear. Considering the lack of time and enthusiasm i’ve had for blogging lately (and that i have an other outlet for my occasional fifteen milliseconds of fame, namely Google+, i’m not sure when i’ll restore Navelfluff. So rest in bits, Navelfluff, and you shall most definitely resurrect. Eventually. Out of sheer curiosity, i got myself a Samsung Chromebook, Model 3, eleven inch screen. The form factor was right, the weight seems right, the price point is right. Hopefully, the wife acceptance factor is alright too – she just got her first Android phone so accessing her stuff on a laptop should appeal. The most glaring difference is the display. The resolution is a mere 1366x768 and if there existed a chromebook at a fairly regular price with 1920x1080 HD resolution, i’d pay the difference in a jiffy. Another pretty obvious difference is speed. An Intel i-series processor and 16 GB of memory is no match to this puppy, but then, i wasn’t expecting a match. And it’s plasticky, not aluminium. But put in another way, you get quite a lot of laptop for three hundred bucks. Detta har jag skrivit med Markdown.